The other day, I was in the fridge looking for something. (Of course, my “looking for something in the fridge” is very different from my teenagers’ “looking for something in the fridge,” but that’s another story…). As I looked for whatever it was, I spied the same half-consumed bottle of soda that I had seen in there for too long. “Whose soda is this?” I asked to no one in particular, though based on the flavor, I already knew the answer. I handed it to him. “Why don’t you dump it?” I suggested. He took it from me, set it on the counter, and walked out of the room. When my brief foray in the fridge was over, I went back to working on my laptop at the kitchen table. W reappeared in the kitchen and picked up the soda. Plunk, I heard a hard object hit the bottom of the plastic bottle. “I put a nail in it,” he replied, as if this was the most normal thing in the world. He screwed the cover on and set the soda back on the counter. I continued to watch him as he came to the table and sat down, returning to the magazine article he was reading. Um… well that was interesting. “What’s to stop your brother from drinking that?” I questioned. He sighed a heavy sigh that let me know he thought I was being ridiculous. Humor me, kid, I thought, as he took one of the smallest sticky notes we own and scribbled a hasty message. He stuck the note on the counter by the soda before he glanced at me as if to say, Happy? 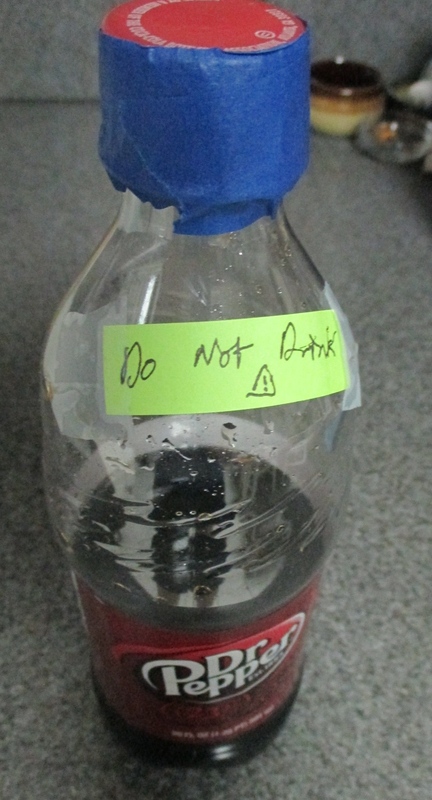 “Fine,” I told him, though I knew I’d eventually have to tape the note to the bottle. It’s been several days, and the bottle still sits on the counter. The nail remains inside, doing whatever nails do in soda. The note has been taped to the bottle, and I know no one is likely to drink it. At least not anyone in my household. But if you happen to be visiting and find part of a soda in the fridge, I wouldn’t suggest you drink it. There’s no telling what kind of mad science might be going on inside…. This summer, more than any other I can remember, my children have been off in different directions, pursuing their own interests. I have one who can drive, so he will frequently take the car and go off with his friends. My daughter trained for, traveled to, and competed in a national competition in her chosen sport. She returned home only to sequester herself in her bedroom so she can complete her many hours of summer reading and projects for the courses she will be taking in the fall. The youngest has spent the better part of the summer in the woods. He has been to camp; he has been camping; he has hiked more than one mountain; and he went off on a multi-day canoe trip. In between his adventures, he has been pursuing his other interests by finding ways to “tinker” and improve one aspect of our house or another. When I returned from several days away with my daughter, I found a fifth bike in my shed, and all of the bikes leaning against each other. Since my shed provides tight quarters for four bikes and the small amount of junk that usually resides there, the fifth bike had to be crammed in. “Right. That would be my point.” I walked back up to the house, but the seed had been planted, and a plan was beginning to develop. 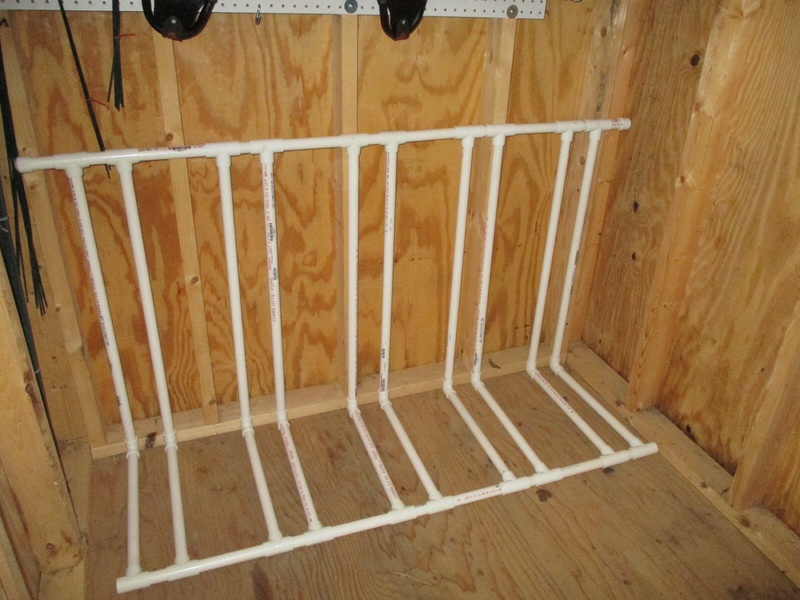 Two days later, I had several ten-foot lengths of PVC pipe, joints, and various hardware on my living room floor. Acquiring the materials was the first step of the project. But then the project leader left the house for a meeting to prepare for his next journey into the woods. C, who had been out with a friend for the day, returned home around dinner time. He walked in the door and started to tell me about his day, and about his thoughts on the headaches he’d been having lately. He was walking into the bathroom while he was telling me this. I burst out laughing. It seems there is always a project. Always “supplies” somewhere in the house. The supplies for the bigger projects end up in the living room for a time. 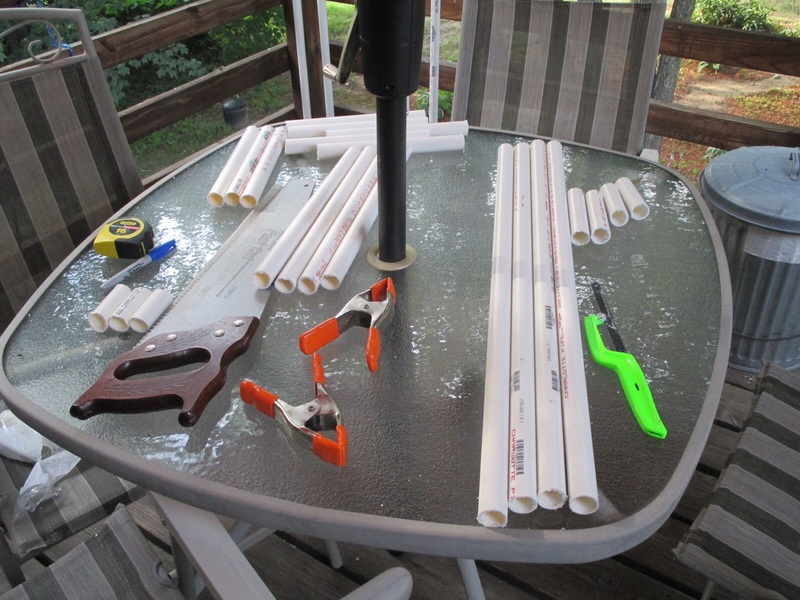 The last time we had PVC pipe in the living room, there was a model “black hole” in the works for a school project. But this time, the project was for the family. Together, W and I sketched and planned; he measured the space, considered distances, and manipulated the plans to get them to work. He tried the “prototype,” and revised his design. He cut the pipe into appropriate lengths, and connected them all together. 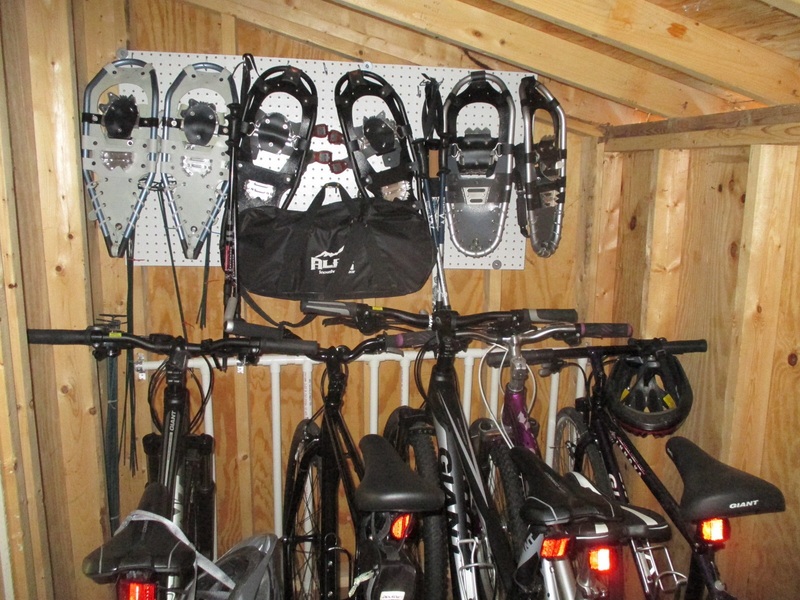 And now, we have a bike rack in our shed that keeps the bikes upright. Isn’t it amazing what summer boredom can do? Yesterday was a quiet day. I spent much of the day working, and J spent much of the day on the couch reading and messaging friends on her iPad. Her brothers were off doing their own thing; one was planning an overhaul of our shed while the other one had gone to the beach with a friend. Several times, I tried to entice her to come out on the deck with me and read, but the fact that I was working was not terribly enticing. Instead, she took up some creative pursuits: a chalk mural in our parking area, sketching, origami. Later, after the head of the day had cooled, I came downstairs from a refreshing shower. She was cleaning up small strips of paper from the floor in the living room. They were squished and rustling in her left hand. She held out her right hand as if to give me something. “It’s not trash,” she said. 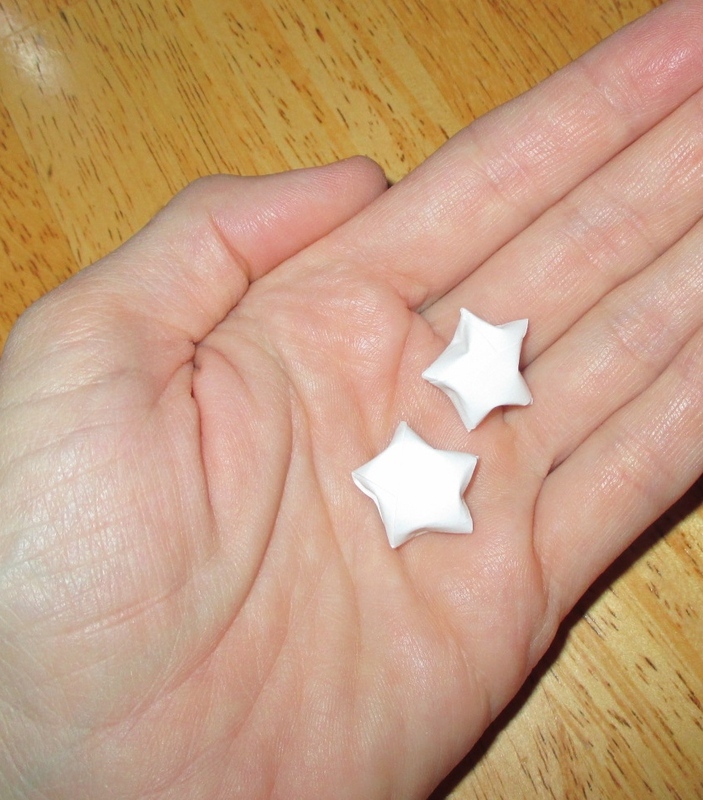 “I have something for you.” Whatever “gift” she had was paper in her hand, white and rustling just like the trash. “No, Mom, it’s not trash. Just hold out your hand.” I sighed, weary and worn down. I held out my hand, fully expecting it to be filled with her paper scraps. Beautiful! And what could be better to fall into your open hand than two paper wishes? “So have you been following ‘deflate-gate’?” my boyfriend asks J as she is cleaning up the dishes from dinner. In my head, I am silently cheering her. Really, I have no interest in football; I have never had an interest in football; and since I have single-handedly raised my children, they seem to have no interest in football, either. Just to get her going, he launches into a discussion of some team or other with some coach or other who is supposed to be amazing. Or something. Truly, J is right. We don’t do football. P’s jaw drops in mock shock. “Give up football? Back when I was coaching….” And he starts yet another story about football. She scrubs the skillet just a little harder, no doubt trying not to listen. “Football. Free. House,” she reminds him when he finishes his story. It was nice of her to let him finish. “Not going to happen,” she says, as she rinses the pan in the sink. “We are football free.” She dries the pan, sets it on the stove, and flounces out of the room. Apparently, we are. Football free.